Israeli Finance Minister, US Treasury Secretary meet in Washington, form joint team to ramp up economic sanctions on Tehran. The US and Israel formed a new joint taskforce charged with ensuring that economic sanctions imposed on the Tehran regime are enforced. 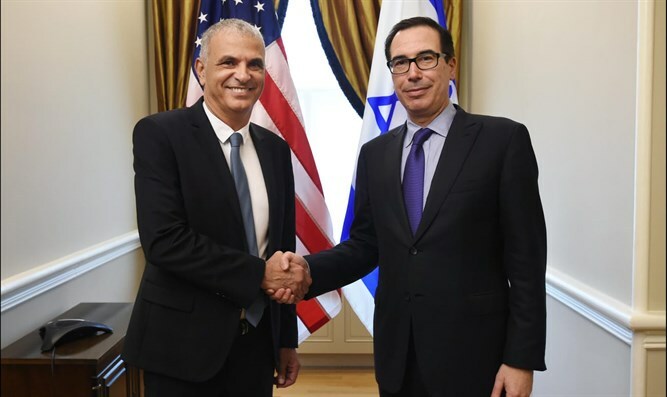 The decision to form the new taskforce was formally adopted during a meeting Tuesday night between US Treasury Secretary Steve Mnuchin and Israel’s Finance Minister, Moshe Kahlon (Kulanu). The meeting, which is the fourth between Mnuchin and Kahlon in the past 12 months, focused primarily on Iran and the economic sanctions reimposed on the rogue regime by the Trump administration earlier this year. To ensure enforcement of the sanctions regime, the US Treasury Department and Israeli Finance Ministry agreed to form a joint taskforce, to be made up of US and Israeli officials from both the Department and the Ministry, which will be charged with tracking enforcement of sanctions in the hi-tech sector. “The economic sanctions that the US imposed on Iran are proving themselves," Kahlon said. “The meeting with Treasury Secretary Steven Mnuchin is intended to deepen our strategic-economic ties with the US. The joint taskforce which we established will be crucial in tightening sanctions on Iran."